A couple weekends ago, Matt was out of town and I was feeling a little lonely and sad (and then mad at myself for losing my independence and not relishing my freedom properly). I was also battling a major sinus situation that was commandeering my head. I decided to cheer myself up by going to Burger King for a veggie burger and fries (which is embarrassing to admit because, in principle, fast food makes me very angry, but it's important to be open and honest about one's foibles!). 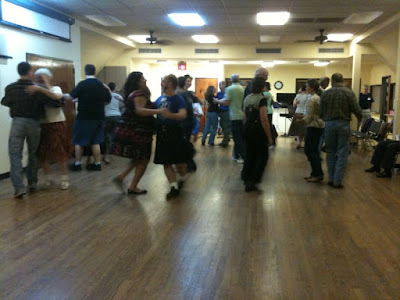 On my way home, I saw a sign that said, "Contradance Tonight!" with a sign pointing toward an Episcopal church in my neighborhood. I haven't seen or thought about contradancing since 2005 when I went on a self-subsidized sabbatical that included a stop over at the John C. Campbell folk art school in North Carolina. Contradancing was a huge deal there, and in an effort to immerse myself in the full experience of folk art school, I took up contradancing. It's a partnered folk dance that involves lots of twirly skirts and live music. 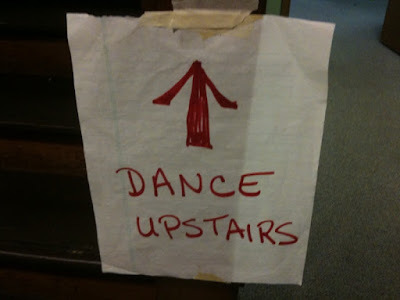 I mustered the courage to follow the notebook-paper signs inside the building and up the stairs. I was immediately welcomed. I somehow let Roy--a regular--talk me into doing a dance, even though I was quite intimidated by my lack of recent experience (I tend to be a perfectionist, so spontaneous partner/group dancing without months of lessons is not really my thing). But boy was it fun! Sure there was the requisite guy who takes dancing way too seriously and gets impatient with my inexperience, but everyone else was super-friendly and fun. As you pass from person to person, you make eye-contact and smile. They even provided name tags! What a great way to build community. I realized that contradancing would be a super fun thing to do at a wedding. 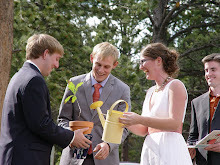 I added it to the list of Ways to Have Fun at a Wedding. You'd have to hire a caller, but contradancing is a really easy thing to learn. A brief 30-minute lesson would introduce everyone to the basic moves. After that, each dance is explained before it starts with a little practice time. 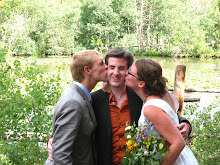 That's just what we did at my recent wedding weekend. The friday night before instead of a stuffy rehearsal dinner we hired a caller and a local band and it was such a great icebreaker/mixer across all ages and nationalities (I married a Brit). People liked it so much they even did some 'swing your partner' at the reception the next night! My half-fiance (I know he's proposing, just not when or how) and I spend our summers at a medieval faire. The best part? Courtly dances. 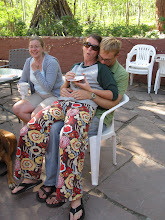 At our eventual reception, we intend to have one of our first group dances be the Gay Gordon, a Scottish "buffet dance." By the end of the dance, everyone has had a chance to dance with everybody else. We're looking forward to it as a way of connecting with every one of our guests. I love stuff like this. It always takes a little nudging to get everyone out on the dance floor and what better way than group dances! I used to Irish dance and I really miss doing the set dances where you line up across from each other and switch partners and twirl around, etc. I'll have to look into it and see if there's anything around me. Thanks for the post! Contradancing is amazing. It's some of the most fun I've had at large gatherings. I can't believe it! There is my friend's picture ON THE BLOG OF A (not so) TOTAL STRANGER! It's a small, small woooorllld! I'm glad you had fun! I'm sure the group would love to have a new "regular". Way to take the chance and get on the dance floor! 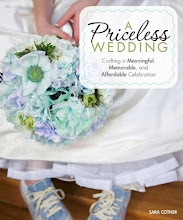 I think it's an awesome idea and sad my wedding is over, b/c I would've been awesome for the DJ to say hey it's time to contradance - people would've gotten to meet new people, albeit briefly, but it would've been something for them to remember about our wedding day. How fun! I wish I had known about contra dancing a few years ago - I was just introduced this summer and love it. It doesn't seem to be as popular north of the border but I agree that it's great, community building fun. The school nearby even had an all ages one in the fall. Hiring a caller is important but the musicians can make or break the atmosphere too. I have yet to hear a band at one of these that isn't awesome! We did this at my wedding, in Australia we call it a Bush Dance. We had a live band who played traditional Australian songs (with Irish, Scottish and English songs thrown in). We had a fantastic caller who worked so well, guiding everyone through the dances. The aim was to get everyone up and dancing, even those who were normally too shy to dance. The switching of partners was brilliant, there were people who had never met before swinging each other across the dance floor! I highly recommend it for a wedding, it was the most fun I have ever had and wish I could do it all over again!